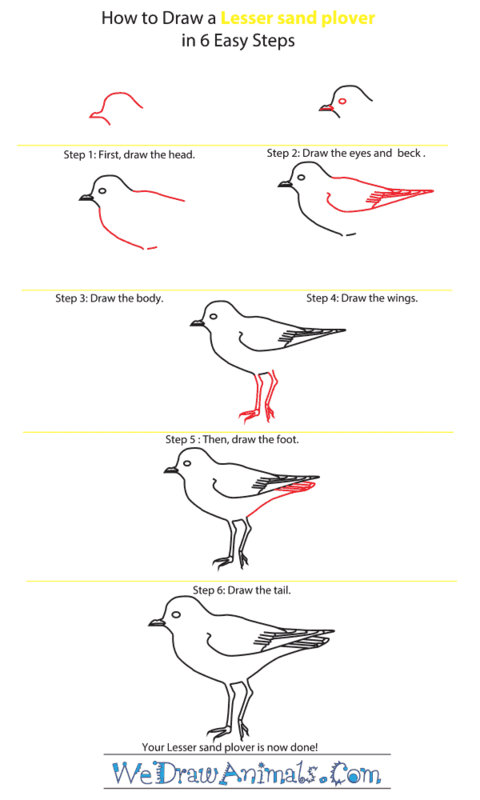 In this quick tutorial you'll learn how to draw a Lesser Sand Plover in 6 easy steps - great for kids and novice artists. At the bottom you can read some interesting facts about the Lesser Sand Plover. Step 1: We first start drawing by completing the outline of the head. 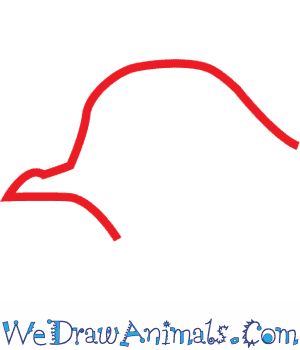 The head should be rounded with a short, pointed beak. 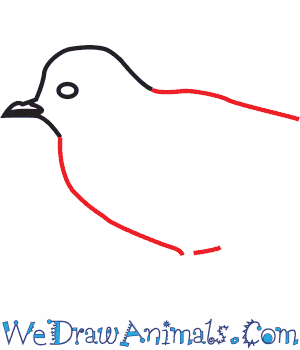 Step 2: Next, draw the eyes and complete the beak. The eye should be a oval shape behind the beak. 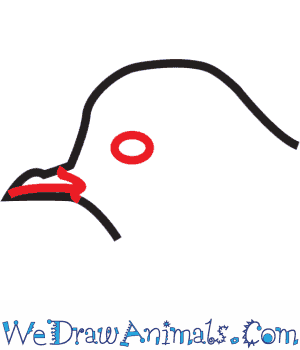 Complete the beak by drawing a straight line. Step 3: Draw the body by drawing two lines. One for the back and one for the belly, leave shape for the wings and tail as well as the legs later on. 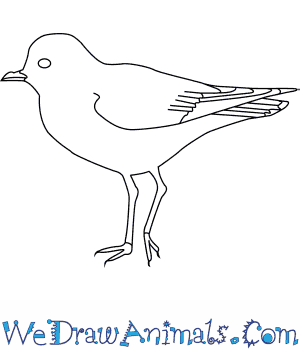 Step 4: The next step is drawing the wings. Draw a curved line that looks like half of a heart and extend the top body line to meet the bottom. Add detail of the feathers. Step 5: Add the legs. Lesser Sand Plover has long skinny legs with knee joints close to its body and only two toes. 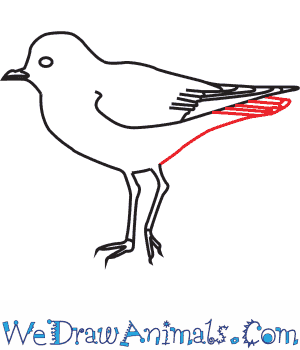 Step 6: Last step is to draw the tail feathers. Draw a line up from the legs but not all the way to the wings. Draw a line down from the wings to meet the bottom line. 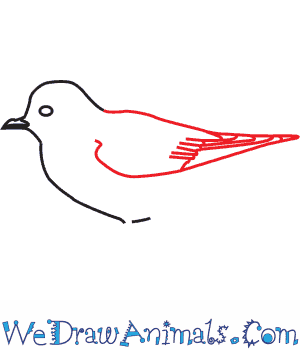 Then add small lines to show the feathers. Lesser sand plover are migratory birds that breed in Southern Mongolia, Eastern Siberia, Himalayas and Western China. During winter season they move to Africa, Middle-East, India and Australia. It has a mix of grey and brown upper body with black forehead while the lower body is white in color. The color of their hair growing on their head and breast changes to rusty red at the beginning of the mating period. They have a distinct feature that separates them from other sand plovers, which is the presence of a black line that segregates their breast and neck. They are 19 – 21 cm long with a wingspan of 45 – 58 cm and weigh 39 – 79 g. They feed on insects, mollusks, crustaceans, worms and seeds. They form groups of up to 100 individuals in non-mating period. Male lesser sand plover provides warmth to eggs required for their development that eventually allows them to hatch. Some lesser sand plover migrate in winter season after post breeding and some stay back. Lesser sand plover may also reside in the footprint of livestock. Their population is decreasing due to pollution and destruction of their habitat. 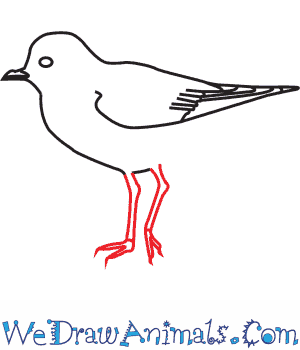 Lesson plan note: Make a few copies of an outline of lesser sand plover. Let children copy the drawing and fill it with colors.